The other Russell took some pictures of Raffles for my book, but I'd never been there myself. 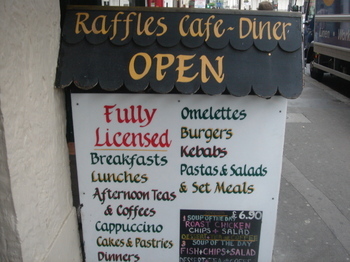 I must admit I'd built an elaborate fantasy Raffles in my head, based on a nice looking fry-up and the green-checked table cloths, and it wasn't quite up to the standards of my imagination, but it was very nice. Very pleasant bacon, and a generous portion, which conceals the yolk of the egg, like the sun on a cloudy day. The eggs had a scattered quality, like the timbers of a building after a hurricane. The beans are like, well, beans. But good beans. This is an excellent ebcb, and good value. You see how the table-cloths sets it off nicely. There's probably something in colour theory that explains it all. Great colours here too. 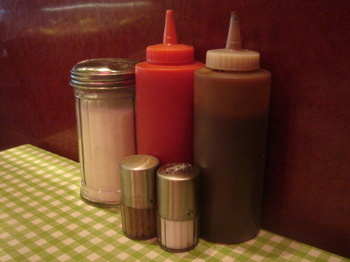 The browns and whites of the salt and pepper echoed by the sugar and the brown sauce. Clean and simple. 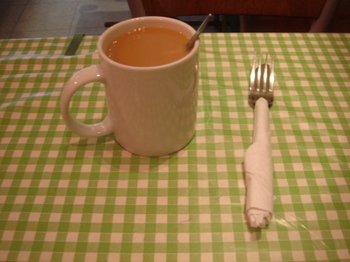 Very respectable cup of tea and the often seen, tightly-wrapped knife and fork, which always reminds me of a mummy or disturbing chinese foot-binding practises. It's a busy place, a blur of motion. And I always like that slightly medieval feel to the lettering and quaint roof to the sign. Raffles USP is the small plastic inflatable Big Ben in the front window - I bet that pulls in the tourists. Other plus points - it's open till 10pm 7 days a week, the black and white photo gallery of Hollywood film stars, and the cafe radio, which seems to permanently play late 70s-mid 80s classics. Have you ever noticed how a good cup of English tea looks quite like a decent cup of American coffee? Also, I don't think I've ever had quite as good a cup of tea over here in the US even though we import our PG Tips. 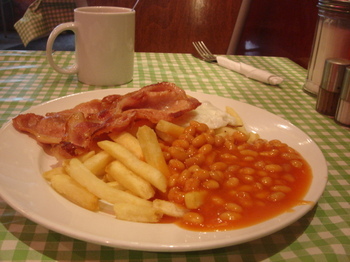 Someone once told me that having chips with an English breakfast was a big no no. Is this really the case? I think it's more traditional to have a hash brown with an English breakfast, but Russel's book shows just how nice it is to have chips instead! I lived next door to Raffles for 5 years, just above the paddington dental practise. 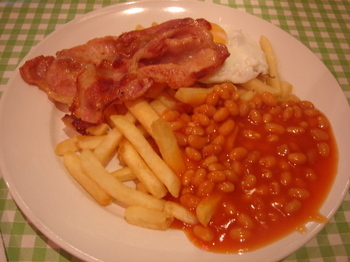 It is without doubt the finest authentic greasy spoon in the whole of london, and completely unparalleled. There is nothing that couldn't be fixed by a big ben breakfast. I had it the morning I shifted in, and the morning I shifted out, and as a mark of respect and sadness. The coffee was the best and I would always get a cup on the way to work. Sid and English Dave loved raffles, as did Stinky and Rich when I took them there. Nat Bliss also loved it. Next time I am back in London, raffles will be on my hit list for sure. God Bless. Ooooooh, this did'nt 'alf make me old 'north-n-south water, it did. 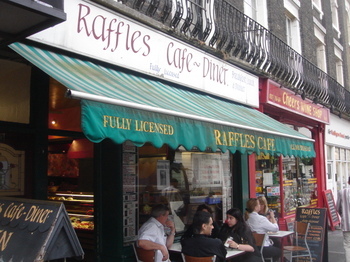 I spent a week in London during the Chelsea Flower Show week and had breakfast at Raffles every morning and lunch one day. The food and service were great. 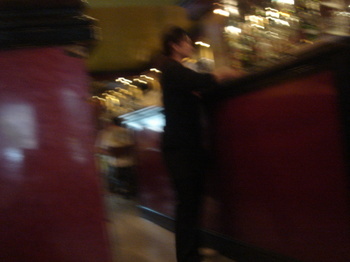 We were served outside by a young man from Turkey. He could not have been more accommodating or nicer. The food was great and a super value.